I’d seen this movie before, or variations of it. Dozens of times. But never while playing Branson golf. I strike a pure sand wedge from 95 yards, sending the ball high against the autumn blue, then watch it light a few feet past the hole on a gentle ledge that, apparently, was flat enough to ward off the nasty backspin I’d managed to impart on the ball’s hide. “Come back,” said one compadre. My first ace in 46 years of battling this damned game. I whooped. My friends whooped even louder. High fives. Hugs. 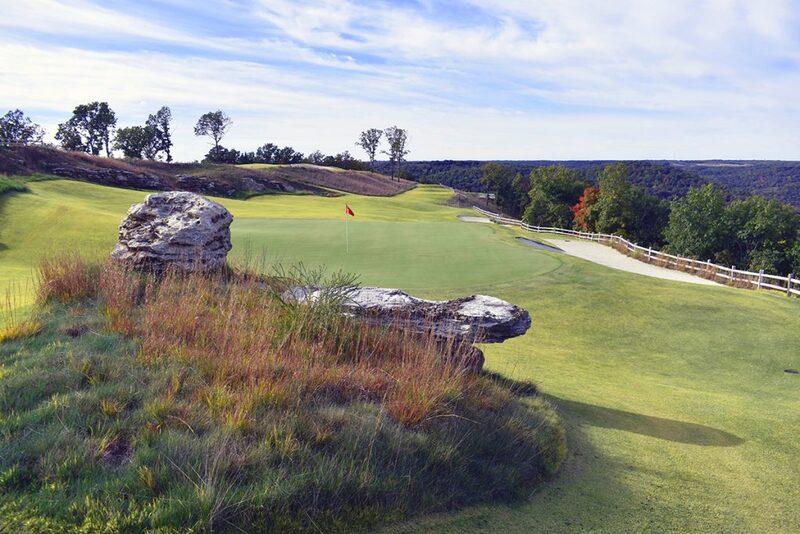 That out-of-breath glow after four holes on Mountain Top, what might be the best 13-hole par 3 course in the nation, certainly in the southern Plains, definitely in Missouri, open only a year and carved through limestone Ozarks cliffs by Gary Player with impish and muscular glee. Yeah, this place called Branson was growin’ on me quick.